Argolida, Argos, Nauplio, Nayplio, Mykines, Mykenes, Epidauros, Epidayros, Peloponnese, Vacation in Greece, Hotels in Greece. Argos: (20,700 inhab.) Argos today is a mid-size, quiet town that sits on the edge of the plain of Argos (described by some guide books as "a rather shabby market town). The modern city lies at the base of the two large hills, Larissa and Aspis, and covers the site of the ancient city. 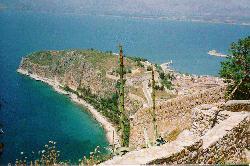 It is a common stopping point for buses from Mycenae to Nauplio, though you normally wouldn't have to switch here. The bus stop is on the edge of the large and open town square and it is a pleasant place to spend a few minutes waiting on the incoming passengers. There is plenty to see of archaeological interest too. The most prominent site is the huge classical theater - no one has to pay here - where occasional performances are infrequently staged. The theater stretches up a very steep hillside and parts of the stage still remain. Many renovations occurred during the Roman period and there is also the remains of a large Roman Bath still standing to its original roof height at places - can't miss it. Mosaics on the floors can still be seen and there is even some sarcophagi visible down in a lower level of the bath. Also see if you can find the remnants of the hypocaust heating system below the floors of some rooms. The Ancient Agora is not readily accessible, but you can wander around the edge of the theater to see some more Roman remains, including a small odeion. If you're in Argos and you have a little time, they also have a very nice, but small, archaeological museum which houses finds from Argos and the nearby site of Lerna. The museum has some great mosaics outside, which have the months personified. Also of note are the krater fragment depicting Odysseus and the Cyclops - at another exhibition when I was there!! - as well as an 8th cent. B.C. bronze suit of armor. Nauplio: (10,609 inhab.) Nauplio, the first capital of liberated Greece (from 1829-1834), has a great little town square and some good restaurants, as well as a decent, small archaeological museum. The museum is located on the second floor of a Venetian arsenal and houses items from Mycenae, Tiryns, Dendra, Asine, Halieis, and of course Nauplio, which served as the naval base of the Argives in archaic and classical times. Some of the more notable items include a bronze cuirass and a helmet made of boars' tusks - not matching, and numerous pottery displays (including the clay figurine depicted here). 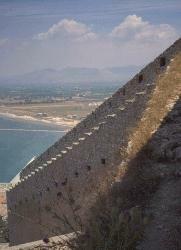 The Castle of Palamidi at Nauplio is quite high but worth the climb once you get to the top (999 steps!). It looks impregnable, and it was designed by LaSalle in 1711, but in battle it fell after only an eight day seige. Mycenes: The oldest archaeological findings from Mycenas are dated around 3000 BC. However, during the alleged Middle Helladic period (1900-1600 BC) the hill was fortified with walls and on the western side there was built a cemetery with tombs inserted in the rock. Around 1600 BC there were built much larger tombs, reserved for distinguished figures. At the same time, they started opening far from the city colossal vaulted tombs, consisting of a long entering corridor and a spacious circular room with a vaulted roof. During the Late Helladic period, the Mycenae were under the sphere of influence of Crete (1600-1500, First Late Helladic Period). Later, Mycenae developed their own civilization, the Mycenean, between 1500 and 1200 BC, which spread to the whole south of Greece, the Mediterranean coasts down to Syria and up to Italy. Around 1350 BC on the hill of Mycenae there were built new colossal walls, preserved up to the present, which surrounded among others a large number of Royal graves. This was the period of the climax of Mycenaean civilization which reached an abrupt end around 1200 BC after the city was abandoned. Today, Mycenae is one of the loveliest places in Greece, thanks both to its natural beauty as well as to the great charm of the archaeological site, associated with so many myths. Treasury of Attreus: The most distant cemetery from the city of Mycenae is the most glorious one, the Treasury of Atreus, as the construction of the "tholos-tombs" was called in antiquity. A long corridor, the dromos, 36 metres long, partly cut into the rock and walled with conglomerate blocks of ashlar masonry leads to a gate 5.40 meters high, surmounted by a lintel and a relieving triangle. The lintel consists of two monolithic architraves, each one literary being a large block of stone, the largest weighing 118 tons. Once, the entrance must have been decorated with two small pillars covered with marble plaster which depicted multicoloured painted representations. Some fragments of these decorations are today kept in the British Museum in London. The burial chamber or Tholos has a diameter of 14.50 metres and it is 13.20 metres high. It is housed by a vaulted roof formed by 33 superimposed courses of joined conglomerate blocks. The vault was adorned with copper rosettes, of which today only a few flowers and small nail holes are preserved. This was certainly a royal grave and it dates from 1330 BC. Therefore, it cannot belong to the victor of Troy VII or even to his father. Epidaurus: In a green valley full of springs and streams, 10 kilometres on the west of the city of Epidaurus by the sea, the cult of the waters was practiced since the mycenaean times. Whereas the worship of Apollo-Maleatas continued at a temple on the nearby mountain Kynortion, deep in the valley, near the sacred springs, a new Sanctuary was built especially for the worship of Asklepios. 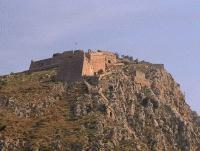 Soon the Sanctuary gained great importace and in the fourth century BC, it was fully restored. At the same time, on the slope of the mountain northeast from the temple, a theatre was built, famous since that time for being the prettiest of all the Greek theatres; this theatre is still preserved in almost excellent condition. The theatere consists of a circular orchestra of 20.28 metres diameter has a centre altar of Dionysus. A small ditch (euripus) runs around its perimeter, in order to collect the rainwater. The cavea has the shape of a fan, with 34 rows of seats, divided into 12 sectors by scales holding approximately 6200 spectators. Beyond the semicircular corridor (diazoma), at a later period, there were added 21 new rows of seats with a capacity of another 14000 spectators. The analogy between the number of rows of the upper and lower diazomae is considered to be mathematically "perfect". The first and the last row of the lower part and the first of the upper part had seats with backs and these seats were reserved for distinguished citizens. A complicated set of relationships, largely based on the theory of the golden cut, gave the theatre ideal aesthetic harmony and almost perfect acoustics. The stage that rose behind the orchestra, most of it lost, was supported by 12 Ionic pillars while at each end it had a jutting-out wing. However, during the Hellenistic as well as the Roman period, it underwent several changes that altered its original shape. As it usually happens in Greek theatres, the two spaces between the stage and the cavea (parodoi or passings) were left open to the public due to great circulation. These were adorned with two glorious entrances with Corinthian pillars. Every year at this theatre there took place feasts in honour of Asklepios, including musical and dramatic presentations. In 1954 the theatre was restored into its original shape and since then it hosts every summer the productions of the Epidaurus festival. 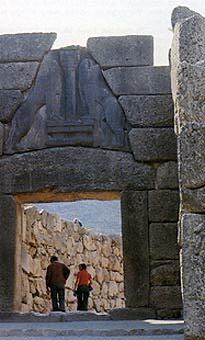 Tiryns: After you've left Argos, and if you have time, stop in Tiryns. Since the buses run regularly down the main road near the site it shouldn't be too long between visits. The only thing to really see here is the acropolis, but it shouldn't be missed. Take a guidebook since the foundations of the palace are confusing. You can still see the hearth, column bases, and even a bath recessed into the floor in the royal quarters. The entire fortress was inhabited from around 5000 B.C. on, and the most extensive constructions are Mycenaean. The walls of the fortress are spectacular. Huge pieces of rock are wedged together to form Cyclopean walls that surround the entire acropolis. Strabo tells us that seven Cyclopes helped to build these walls; I guess we'll just have to take him at his word. 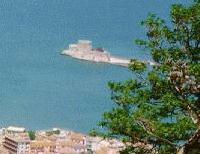 From on top of the palace you can get a great view on to Nauplio. The entire complex seems very strange, rising up abruptly from the plain just about a mile from the gulf. The lower section of the fortress (seen to the left in the picture) has now been closed off as has some of the upper level due to some of the stones falling from their places.